Our first full day on our 10 day New Zealand cruise was a stop at the port city of Tauranga which, technically the port is in Mount Maunganui. Mount Maunganui is a resort community on the coast. Most cruise tours use this port to take guest to places like Rotorua. 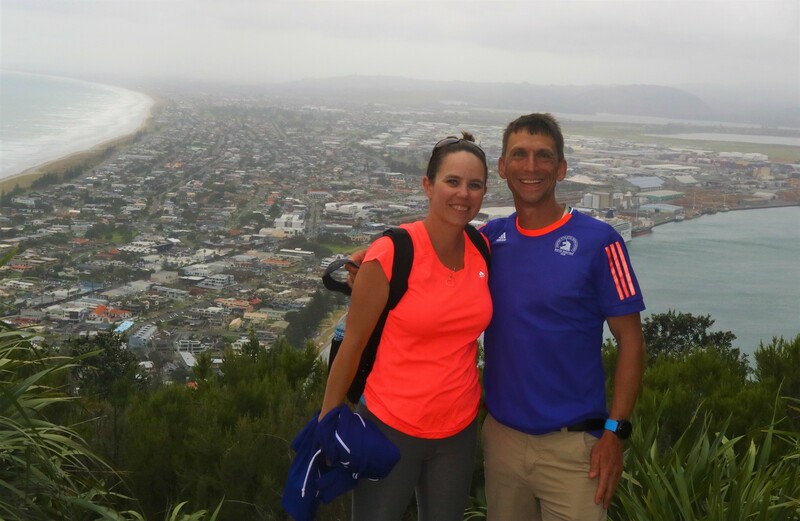 But because of our pre-cruise tour we had already seen Rotorua so we decided to use the day to explore and hike Mount Maunganui. The main thing you see when you get off the ship is a big mountain and of course we are going to want to hike it. We started off walking down the main street with lots of shops but cruise arrived early and none of the shops were open yet so we headed to Moturiki Island. During low tide you can easily walk to the island just be careful with the tide as you could get stranded. Moturiki Island is a short and relatively flat hike to the end of a peninsula. There are great views back to Mount Maungnui. Interesting fact that there used to be a pool on the island but it was shut down many years ago. This was the first and only day we had cloudy weather during our entire trip. It sprinkled a little but we can’t complain with one day of so so weather. We walked down the Marine Parade (aka street by the beach) to the bottom of Mount Maunganui. There are many paths up to the top but we choose the fastest and vertical option. It was a quick and intense hike to the top about 1 hour. We noticed lots of people working out on the paths and campervans near the bottom of the Mount. Once we made it to the top there was an amazing view back towards our cruise ship. You could see for miles but we decided to head down when we heard thunder at the top. We took a different hike down on the back of the Mount Maunganui. It was longer but more scenic via the 4×4 trail. The gate for the sheep. There were very few people on the back of Mount but there lots of sheep. They had gates that you had to go through so the sheep would not escape. The sheep were really not interested in us only grazing on the grass. Lots of amazing views. If only the sky was as blue as the water. We made it back down and past the public hot spring pools. We didn’t have our bathing suits otherwise we would have paid to take a dip in the hot springs. Then walked in the cute downtown shopping area searching for gifts. And finally made our way back to the ship. A cute downtown area with lots of restaurants and shops. They also have a mini train car ride that you can take to explore the town. It was called Pepi Toot.